19 Jan 2019, 2:36 p.m. 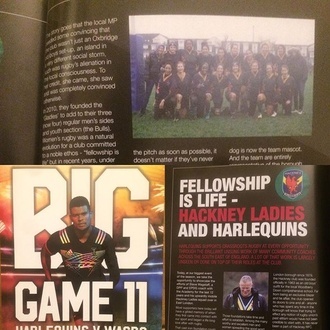 In good news for the Club, Hackney Ladies were featured in the Harlequins match programme for Big Game 11, held last Saturday at Twickenham, the home of English rugby no less. Coach Steve Wagstaff, with his 12 years of experience at Harlequins, was asked to lift the lid on the incredible progress in women’s rugby at the Club. Fair play to Steve, who represented us well! There was a full house of 80,000 in attendance, so let’s hope a few readers will know more about who we are, and what we’re about as a result! Harlequins supports grassroots rugby at every opportunity through the brilliant unsung work of many community coaches across the south east of England. A lot of that work is largely unseen or done on top of their roles at the Club. Today, at our biggest event of the season, we take the opportunity to showcase the efforts of Steve Wagstaff, a DPP and EPDG coach with the Academy for the last 12 years and his upwardly mobile Hackney Ladies squad over in East London. Most supporters will have a gilded memory of when they first came into contact with our sport and began a lifelong love affair with rugby. That cast iron foundation could have been your first match as a spectator as a child, or the first time you picked up a ball to play this the toughest but most rewarding of sporting pursuits. The common denominator is rugby’s infectious ability to create memories and friends for a lifetime. Those foundations take time and effort to establish. Among the many worthy and excellent men and women spreading the good word in our game is Steve Wagstaff, a stalwart of the Harlequins Academy Elite Player Development Group (EPDG) and DPP programmes for 12 years who has taken charge of Hackney Ladies (and latterly men) over the past 18 months to stupendous effect. Although records reveal that rugby has been played in the East London borough since 1879, the Hackney club was founded officially in 1963 as an old boys’ outfit for the local Woodberry Downs comprehensive school. Far from being an exclusive blazer and tie affair, the club opened its doors to one and all - anyone who has spent any time in the borough will know that trying to effect any notion of rugby union’s past elitism would have not been credible to start with. It has never been a part of Hackney RFC. Facing extinction in 2004 and fielding only one senior side, the committee were proactive, determined and passionate - exploding perceptions of a “posh sport” in a borough beset by poverty and social challenges and absolutely a football heartland where Arsenal, Tottenham and West Ham shirts dominate, sprinkled with the requisite Chelsea, Liverpool and rejuvenated Manchester United these days. The story goes that the local MP needed some convincing that the club wasn’t just an Oxbridge old boys set-up, an island in a very different social storm, such was rugby’s alienation in the local consciousness. To her credit, she came, she saw and was completely convinced otherwise. In 2010, they founded the ‘Gladies’ to add to their three (now four) regular men’s sides and youth section (the Bulls). Women’s rugby was a natural evolution for a club committed to a noble ethos - “fellowship is life” - but in recent years, under Wagstaff’s very capable eye, Hackney are making waves. “It’s one of the most satisfying aspects of my career so far,” says the experienced coach, formerly DOR at Barking, Westcombe Park and Assistant Coach at Ealing Trailfinders under current supremo Ben Ward when the side were promoted to the Championship. “Personally, having been around rugby all my life, women’s rugby is the fastest growing aspect of the sport I’ve ever seen. “We literally get people walking up to training almost every week, some of whom have never played before, but some of whom have played Dubai Sevens, or even at the likes of Bristol - they gravitate towards it because of the atmosphere the committee have engendered. “It makes my life really easy. It’s fostering an environment where I don’t have to go looking for players, they come to us. “When a new player arrives, they are buddied up, looked after, made to feel welcome, the captain makes sure that she’s got all their details at the first session. We get them on the pitch as soon as possible, it doesn’t matter if they’ve never played before. “We give them the basic skills and get them out there to see what happens, because they learn by playing - but maybe not immediately in a league game! To see the improvement is so satisfying. Wagstaff is a rugby lifer, having played here and in Australia to a fine standard, refereed up to level 6 and made his living juggling police duties and his sporting passion (rather like Karen Findlay). Son Taine now plays and coaches in New Zealand, like father, like son - “I think his mum is a fan of Taine Randell!” quips his proud dad. As a regular supporter on the muddy touchline at Spring Hill Park, readers can be assured that we’re not talking about pristine facilities here, everything you see is driven by an intoxicating mutual respect, comradeship and love of the game. My daughter plays, my dog is now the team mascot. And the team are entirely representative of the borough badge they proudly bear - come one, come all, you are welcome. “The facilities we’ve got are fairly bare bones but what we have is a burgeoning, successful women’s team in a football heartland which is supported by association with Quins, yes, but also through their own hard work. It’s fantastic,” says Wagstaff. “One of the keys to Hackney’s success is that they are self-reliant - they don’t rely on anything, they make it happen themselves. “We’ve gone from being a social, turn-up side to a competitive team who when they lose, self-reflect and really learn from it. It was refreshing to arrive to an environment where there was a constant thirst for improvement, not just turning up. It took a while, but I saw it happen in front of me. “I thought it would be good to expose them to the environment of a top Tyrrells and Gallagher Premiership club. I’ve known Gary Street and Karen Findlay for years so I got in touch with them. “They agreed, completely off their own back, that we could go over there before a development game against Worcester and have a session then watch the game afterwards. I thought they might do a quick 15-20 minute bespoke session for us but Gary, Karen, a couple of other coaches and all the S&C guys gave us a proper session and the girls responded. “We had 27 turn up on a cold Sunday morning and it was a fantastic experience for them. They made us feel so at home - that’s what Quins is all about. I knew they would because I’ve been part of it for 12 years. “We were able to use the changing facilities at Surrey Sports Park, one of our Welsh girls was there with Jamie Roberts, which might have been the highlight of her life! The inspiration has worked. The ‘Gladies’ were promoted last season and now sit second to Sutton & Epsom in NC1 with the development group pushing for a league start - they dispatched a plucky Reading Abbey 49-0 just prior to Christmas in what we could describe as monsoon conditions, had it been warmer. As it was it was good old fashioned British fare. Miserable, but smiles abounded regardless, like at every game. One player, a local 17 year-old is now involved in the England development programme, several have played at county level, but Wagstaff is swift to re-iterate that although that pathway is tangible and actively pursued by Hackney for any player with promise, it’s the club, the friendships and experiences that are every bit as invaluable as caps and cups. “There are so many of the ladies who now have an opportunity to play rugby which they never would have got anywhere else. It’s an open, encouraging environment where serious sport is encouraged as well as participation,” he says. “We have so many communities merging together in an inner city area. It’s reflected in our ladies team. We have people from different jobs, races, religions, creeds, colours, whatever. They all merge into one successful team, they come together, help each other out. “There is a clear pathway there. It’s a lot easier because there is a smaller playing pool at the moment, that may change in 10 years’ time, but there is a push towards getting women into elite rugby at the Tyrrells level. “If we had someone that Karen or Gary thought were good enough for the Quins firsts, we would drive them down to play and more than happily cheer her on! “The obvious one is Kyle Sinckler! I had him at Ealing as well - along with Jack Clifford.